I am interrupting the August energy challenge to bring you a blog post about food. This is a simple dish, easy to make with leftovers, but sometimes simple food communicates the language of love. I haven’t done so many food blog posts in recent months. In part this reflects a strategic shift into more financial and savings motivation topics. But also I kind of lost my cooking mojo for a while. Cooking has to me been something that comes from the soul. I love cooking for people who are significant in my life – friends, lovers, family. I love cooking for my kids, but being under eight they are depressingly uninterested in anything that involves variety, or indeed anything interesting. I used to love cooking for Mr Red Sports Car – but for a several months after it all fell to pieces I could hardly think about cooking anything that involved much creative input. I just had no enthusiasm. But my cooking mojo is back. I am inspired now into imperfect action using up what is in my fridge. I am nearly at the one year mark for living on $50/grocery spending a week – and I am excited to announce that in September I will do a 21 day $50/week challenge. (Thank you to all my readers who told me that this is what you would like to focus on – join us in the Frugal Dare to Millionaire Facebook group to share our money saving wins.) Currently I am about halfway through an Energy Savings Challenge. I don’t yet have the right technology to do a savings challenge properly, so it is all about imperfect action. And this is a recipe inspired by imperfect action. A few weeks ago, I returned from a full weekend at Problogger Evolve, including a full day at the Mastermind. It was a busy weekend, I got little sleep and it was compounded by needing to be at the airport at 4.30am on Monday morning for the flight back (enhanced security measures following the latest terrorism threat). Work was busy afterwards, my head was bursting with blogging and website ideas, and I didn’t have time all week to do any shopping. But I made do. On Thursday, a good friend invited himself over to dinner. I had this ‘oh no, I have nothing to cook in the house’ moment, and nearly said no before I decided to instead take an imperfect loaves and fishes approach to cooking and hosting. I recalled last year seeing around three references to a delightfully simple lemon and cream fettuccine dish in Anthony Capella’s foodie novel, the Wedding Officer. Set in Naples during World War II and involving a romance between a British army officer and a sensual Italian cook, the novel was beautiful and the recipes were all so terribly evocative. It just happened that lemon, cream and pasta were some of the only ingredients I had on hand (cream had been frozen and not that flash but still okay when cooked). So I made this dish. And as cooking it, my friend (who has been a rock of strength and close confidante these difficult few months) kissed me in the kitchen. Just like that. He is now much more than a friend. And none of that would have happened unless I had embraced imperfect action by having him over mid week and making this dish. I can’t guarantee it will have a romantic effect on you or people you serve it to, but it will now always have special meaning for me. I am sharing it now with you with love. In the meantime, melt the butter in a heavy saucepan. Add the lemon juice and lemon zest. Shortly before the pasta is ready, add the cream and heat through (try to avoid boiling it if possible, but it is not detrimental if it boils a little). Add the pasta, when cooked, to the pan and then season generously with salt and pepper. 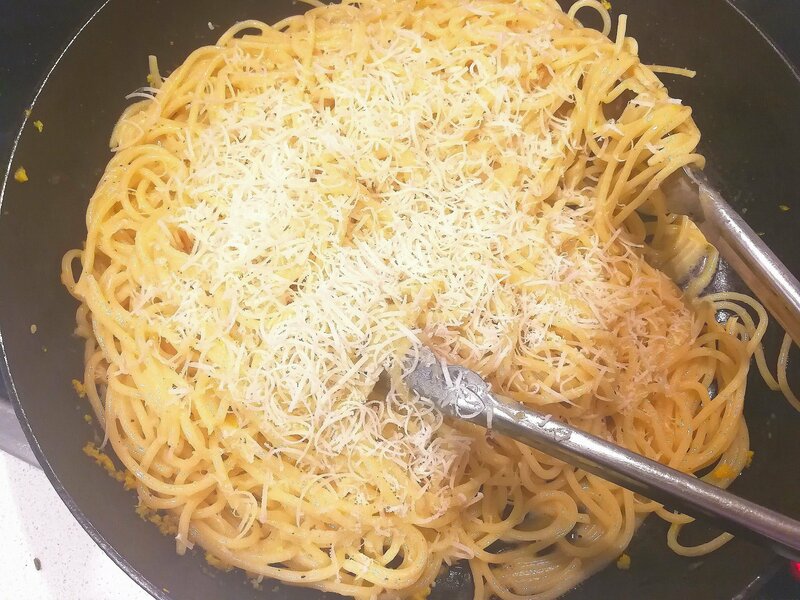 Top with Parmesan cheese. I love this idea using pantry ingredients. When I don’t have cream I often use full cream milk powder made up double strength! I love your idea of using milk powder made to double strength. When you use what you have and cook with love, it always turns out well. And if it doesn’t, it was made with love so is all good anyway. LOL! I was dating someone else at the time. He was very persistent! Nice to be getting back into the kitchen, even nicer with company. Lovely story. I’ll definitely have a go at this, lemon cream pasta sounds simple and delicious. Thank you. Yes, this is ever so simple. I thought it would be much heavier and richer than it was, and I kept thinking I would need to add stuff like garlic or spring onions or vegetables, but simple is definitely the best with this. Nice job 🙂 Must say I love the lemon zest buzz to make a dish zing too. I’d forgotten about this simple dish and think it just might be on the menu this week. Sometimes simple is best, isn’t it? One of my friends gave me the absolute best home grown lemons as a belated housewarming gift. She knows me so well.